On February 21st, seven days after the tragic shooting at Marjory Stoneman Douglas High School in Parkland, Florida, fellow students and parents of the 17 victims who were killed met with President Donald Trump at the White House. In the televised meeting, before a room full of press, Trump pledged to pursue "very strongly...age of purchase," and committed to strengthening background checks and working on related mental health laws. The day before, the President directed the Justice Department to move forward on banning devices like the rapid-fire bump stocks made famous in last December's Las Vegas massacre that killed 58 people. At the meeting, which also included parents of children killed in the Columbine and Sandy Hook shootings, Trump also advocated allowing teachers to carry concealed weapons. He clarified later on twitter his intent was not to "give teachers guns," but "to look at the possibility of giving concealed guns to gun-adept teachers with military or special training experience - only the best. 20% of teachers...'"
On the morning of February 28th, in a televised bipartisan meeting with senators at the White House, Trump called for a "comprehensive" approach to guns and "one great piece of legislation" that could also include raising the gun-purchasing age from 18 to 21 years old. At one point, addressing Senator Pat Toomey (R-PA), who has co-authored with Senator Joe Manchin (D-WA) legislation to strengthen background checks, whether they had left out the increase in age because senators are "afraid of the NRA." In response to subsequent input from other senators who pointed to the power of the gun lobby, Trump responded that while "they have great power over you people, they have less power over me." On the night of February 28th, Trump held an "unscheduled," private meeting with the National Rifle Association's (NRA) leadership in the oval office. Afterwards, NRA Executive Director Chris Cox tweeted Trump and Vice President Mike Pence "support the Second Amendment, support strong due process and don't want gun control." The next day Senate Majority Leader Mitch McConnell (R-KY) said he did not expect any gun legislation to move forward soon, including a more moderate proposal by John Cornyn (R-TX) and Chris Murphy (D-CN) that focuses on incentives for agencies to comply with reporting to the National Instant Criminal Background Check System. On Monday, March 12th, President Trump abandoned his stance on raising the gun purchasing age, saying "There is not much political support" for it. He also backed out of his earlier support for expanded background checks and a ban on assault weapons. In 2016 the NRA spent $30 million to help elect Donald Trump president. Yesterday, March 14th, one month after the Parkland shoots, thousands of students nationwide sent a message to the President, walking out of their classrooms in a demonstration of unity to demand stricter gun control laws. At 10:00am, in four time zones and over 40 states, students left their classrooms for 17 minutes -- one minute for each of the 17 people killed at Florida's Marjory Stoneman Douglas High School. 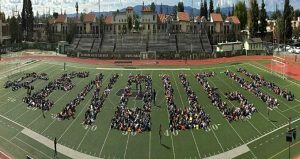 From high school parking lots to state houses and the White House, students paid tribute to the victims of Parkland and other mass school shootings, calling for common-sense gun control. 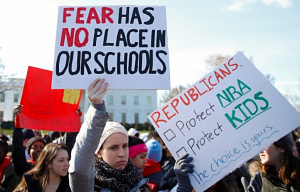 The call to action included a ban on assault weapons, universal background checks and a gun violence restraining order law, as well as opposition to any legislation that would fortify schools with more guns. On Saturday, March 24th the Parkland survivors have organized #MarchForOurLives, a national march and day of action in Washington, DC to demand that a comprehensive and effective bill be immediately brought before Congress to address gun violence and school safety. "Change is coming. And it starts now, inspired by and led by the kids who are our hope for the future. Their young voices will be heard."